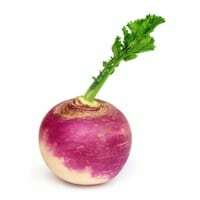 Turnips are in season October through March. Turnip greens are an excellent source of vitamin K, vitamin A, vitamin C, folate, copper, manganese, dietary fiber, calcium, vitamin E and vitamin B6. Look for smaller turnips with unblemished skin that are firm to the touch and heavy for their size. Larger turnips tend to be woody and rough-tasting. Avoid turnips that are soft to the touch or contain mold, black spots or cuts. Store turnips unwashed in a plastic bag in the vegetable crisper drawer of the refrigerator for up to 1 month. Slice off the root end. Larger turnips should be peeled, but smaller turnips (2 inches or less in diameter) can be cooked without peeling. First cultivated in prehistoric times, turnips gained popularity during the Middle Ages as a main vegetable for the poor. Can turnips be stored like potatoes…in a cool dark place for the winter? ?